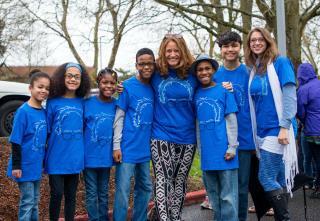 (Newser) – A social worker worried about the welfare of the Hart family called 911 in Washington state the same day the family's SUV plunged off a cliff in California. The Department of Social and Health Services employee told dispatchers in the March 26 call that she was requesting a welfare check after repeated failed attempts to locate Jennifer and Sarah Hart and their six adopted children, People reports. "I've been to the home Monday and Friday and knocked on the door just this morning, and I can get no response," the worker said. "Different cars have been moving in and out, I noticed, so I feel like someone is there." The worker said she was worried about the family because of "concerns the children aren't being fed," reports KPTV. If this isn’t the biggest black eyeball injury to lesbian parenting. Don’t even pay attention to the happy looking family portrait together. I feel sorry for the kids, not the Mom and Mom. Clearly this social worker needs to be fired, everyone knows you should give as many children as possible to lesbians as there can be no better "parents" than homosexuals. Just ask any socialist. They don't look neglected in that photo. What was the social worker's evidence? My guess is that she had a sense something was wrong and picked a 'probable cause' from a book to justify her visits.